We're joining the building frenzy in Rotterdam... Our development 'Op de Hill' is coming to life. The foundation is finished and the first walls are up. You can really start grasping the outline of the seven sustainable houses. The OP DE HILL project was initiated in our development division and designed by our architecture department. OP DE HILL is a small-scale new housing project in Hillegersberg, consisting of seven gasless and energy-efficient homes. Team P·A wishes you a happy new year! We are back in the office after two weeks of holidays. We are excited for 2019 and have some nice projects coming up. Did you miss our holiday newsletter? No worries! click on the images to read more on some of our highlights of 2018. READ MORE ON SOME OF OUR HIGHLIGHTS OF 2018! An article discussing the results of Weerbaar Weert appeared in the local newspaper De Limburger! (read the article here) We are excited to share the results of this collaborative research project. Weerbaar Weert is a vision for the historic city center of Weert based on (design) research. The focus is on the opportunities that the history of the city center can offer when thinking about climate adaptive measures. We worked in a team with NOHNIK architecture and landscapes and Architectuurhistoricus Lara Voerman in collaboration with the Gemeente Weert. The research is part of the program 'Erfgoed & Ruimte' by the Stimuleringsfonds Creatieve Industrie and the Rijksdienst voor het Cultureel Erfgoed. On February 21th, minister Van Engelshoven and representatives from governmental organizations singed the ‘Erfgoed Deal’ (Heritage Deal). We presented our project Weerbaar Weert to the minister and Rijksbouwmeester Alkemade and offered the minister a copy of our research. The ‘Erfgoed Deal’ is an agreement on the use of heritage in the major spatial challenges of our time: energy and sustainability, climate adaptation, and urban growth. Weerbaar Weert is a perfect example of this approach. In the project, we took cultural historic values as the starting point for climate adaptive measures for the historic city center of Weert. ‘Weerbaar Weert’ is a project of NOHNIK architecture and landscapes, Personal Architecture and Lara Voerman for the Gemeente Weert. Weerbaar Weert was part of the 'Erfgoed en Ruimte' trajectory of the Stimuleringsfonds Creatieve Industrie and the Rijksdienst voor het Cultureel Erfgoed. Last Tuesday, the proud new owners of the houses in the OP DE HILL project met their future neighbors on the construction site. They had the opportunity to leave a time capsule with a message in their foundation. The content varied from children’s drawings to a personal note to the year 3000. The OP DE HILL project was initiated in our development division and was designed by our architecture department. OP DE HILL is a small-scale new housing project in Hillegersberg, consisting of seven gasless and energy-efficient homes. want to know more about the op de hill project? Congratulations, Maarten! He was elected vice-president of the board of the BNA - the Royal Institute of Dutch Architects. Maarten has been a member of the board since 2016 and is a passionate advocate on the professionalization of the architecture branch. The sale of OP DE HILL is in full swing! We are realizing seven energy-efficient, gasless new-built houses in Rotterdam. The houses are located in the quiet and child-friendly Hillegersberg Zuid, with the bustling center of Rotterdam just a stone's throw away. Want to know more about the project? Visit the projectwebsite and call Vogelenzang de Jong Makelaars. We are going on our summer break. Our office will be closed for two weeks. No worries, we'll be back with more exciting architecture soon! Read this interview with mayor Aboutaleb on the energy transition in Rotterdam posted in AD Rotterdams Dagblad. Attached to the article you will find a piece on the launch of Zon in de Stad (dutch only). Aboutaleb underlines the importance of awareness when it comes to (solar) energy! At the Rotterdamse Dakendagen Jip promoted one of our projects 'Zon in de Stad' at the info market in the brand new 'Luchtpark' on top of the Hofbogen. Zon in de Stad is a project we initiated together with Climate Focus and HilgersomDeen Duurzaam. Our goal is to promote solar panels in Rotterdam, starting in our neighbourhood Middelland, and to make solar energy accessible for all in a fun way. Yesterday, Merels' students gave an intermediate presentation about their housing project in Amsterdam. In groups, they presented their mass study and first results. It was an inspiring morning and we are all excited to see what the students come up with the coming weeks. That means that after Sander, Merel is the second team member to teach a design course at the Faculty of Architecture and the Built Environment TU Delft. This week our first client walked around in our design for his house with the help of real-time VR technology. We showed him some of the design changes we came up with this week. Real-time VR technology enables us to literally walk a client through our design and guide him along the way. The realism of this experience helps to understand the consequences of the design choices much easier: you can actually see what you get before construction even starts! also interested in a vr experience? contact us! The construction of the watchtower in Bergen op Zoom has officially started. The Stayokay hostel & Natuurpodium we designed opened its doors in 2015 and will now be completed with this tower! It was an honor to have alderman Yvonne Kammeijer do the first excavation on site. On the 25th of January, a call to mayor Ahmed Aboutaleb on behalf of over 50 Rotterdam based companies and organizations was made. The companies, of which P·A is one, call on Rotterdam's politicians to speed up the leap towards a circular and sustainable city. "The time of words alone is over. Rotterdam must now fully focus on actions and build a future proof economy," the signatories state. Besides signing P·A is of course already working on these topics in Rotterdam with our recent research into water resistance and the ongoing research 'Zon in de Stad'. The Municipality of Rotterdam, the Together with NOHNIK and Lara Voerman, P·A will present their first findings in their 'Weerbaar Weert' research at the first KCNL 'Kennisdeeldag' conference 'De Klimaatbestendige Stad' on the 25th of January. A short pitch will be followed by two masterclasses on how to connect cultural heritage with climate adaptation through design. Interested in attending? This brand new project is initiated in our development division and is at this moment being designed by our architecture department. The seven energy efficient family-homes in Rotterdam north will positively contribute to the quality of the immediate environment. The houses will be offered for sale during spring and we expect to kickoff construction work around April 2018. The Royal Institute of Dutch Architects (BNA) has invited P·A to pitch ideas for sustainable future cities at EXPO Real 2017 on Thursday, October 5th. During the ‘Pitch Fest’, leading entrepreneurs from the creative sector will present inspirational ideas and concrete plans for robust and livable cities. P·A pitches a proposal for a combined rainwater beer-brewery, carwash and playground on one of the central squares of Münich to raise awareness for the water assignment that most European cities are facing. EXPO Real is a leading international trade fair for real estate and investment. P·A is working with education provider Luzac, to ensure that the organization’s corporate identity is visible in each of its 19 locations throughout the Netherlands. Luzac is the largest provider of private secondary education in country. P·A has put together a handbook to guide the organization in the selection of décor. The handbook strengthens the organization’s brand identity and ensures that each facility has recognizable ‘Luzac’ elements whilst emphasizing the unique qualities of the buildings and the local flavors of the surroundings. The next step is the translation of the handbook into a décor plan for each location. Maarten Polkamp was reelected for a second term as board member to the Royal Institute of Dutch Architects (BNA) during a recent assembly. Maarten is looking forward to building on the strategic plan ‘2017-2019 IMPACT!’, which was recently launched by the BNA. Canadian/Italian couple Laura and Matteo have asked P·A to design a unique private residence in The Hague. The project creatively combines two traditional houses into one residence. Construction will be completed in April 2018. Tonight Sander van Schaik will be part of a panel discussion on solar design with Solar designer Marjan van Aubel and LOLA landscape architects organized by AIR, architectuurinstituut Rotterdam. The discussion will take place after a keynote by Marjan van Aubels on her innovative practice where she merges sustainability, design, and PV-technology. Sander will share our experiences designing solar for Zon in de Stad. Last Saturday, we took part in community festival Middfest with Zon in de Stad. To promote solar energy and include people in the design process of the solar hubs, we came up with an exciting solution. We tested the design with Virtual Reality powered by a mobile solar installation. It was a great way to harvest feedback on the design and show the exciting possibilities of solar power at the same time. 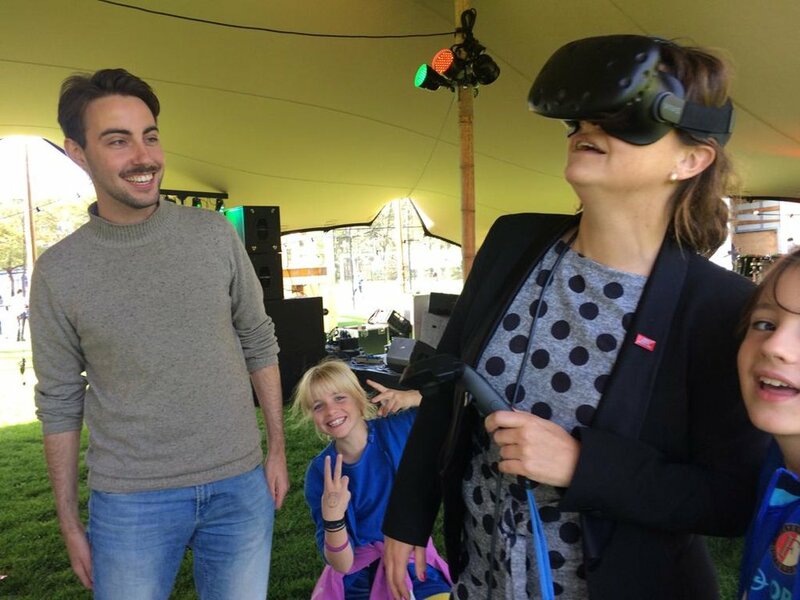 Even alderman Barbara Kathmann of the Gemeente Rotterdam took time to 'walk-through' our design in VR. Want to learn more about the sustainable house we designed for our clients John & Peter? Binnenstebuiten visited the project! John & Peter fulfilled their dream of living on the countryside in a sustainable manner. Our design combines the traditional typology of the area, with oblique roof and use of bricks, with the modernist villa John & Peter dreamed of. The result is a bold building that manages to effortlessly blend into its rural surroundings. Have a look at the project! At the Midellandstraat, just around the corner, a poem by Derek Otte is being painted. We can't wait to see the final result! This striking building had been abandoned for years. Our clients, who grew up in the neighborhood, couldn’t stand it any longer. They asked us to come up with a plan for a transformation. We turned it into three apartments, a cafe and restored the facade carefully. In our design, we reintroduced the historic banner on the facade as a place for artwork. Now, this vision is coming to life! 4th of september, sales night! On Tuesday the 4th of September at 20:00 the sales night of our project OP DE HILL takes place. We are realizing seven energy-efficient, gasless new-built houses in Rotterdam. The houses are located in the quiet and child-friendly Hillegersberg Zuid, just a 10-minute bike ride from Rotterdam Central station. Interested? RSVP via the real estate agent. Have a look at the projectwebsite! This week, Ellen and Juliette visited one of our building sites in The Hague to check out the immense stairs being installed. The staircase was prefabricated, hoisted over the building, and is now being hauled in piece by piece by the true craftsman of Volders smederij & constructiebedrijf - really spectacular! The early twentieth-century house is transformed into the dream house of our ambitious clients. We proposed a series of bold interventions - including this eye-catching staircase. check out more spectacular constructions of Volders B.V.
Our 'ode to brick' project has recently been submitted for two competitions! View the submission for 'the Next Step Program' and the 'BNA - beste gebouw van het jaar 2018' here. "We prefer a modern white villa with a flat roof, but we suspect that the municipality will not accept it" - was the first comment of our clients, John and Peter, when asked about their wishes for their new home. Our design combines the traditional typology of the area with the modern villa our clients desired. As a result, the house merges into its surroundings. Only if you look closer, you will discover its striking open character. On June 1, 2018, the International Architecture Biennale Rotterdam (IABR) will launch its eighth edition. The IABR applies this edition to the challenge brought in the Paris Agreement. The urgency to do so is clear, the question is how we are going to adjust. How can we bridge the gap between global issues and local places? The IABR established three Rotterdam Ateliers to research this 'Missing Link'. Over Morgen, Urhahn, Inicio and P∙A will investigate how the energy transition can act as a lever to promote inclusive urban development in Bospolder-Tussendijken (BoTu). In this atelier, the IABR teamed up with housing association Havensteder, the Delfshaven Coöperatie and the City of Rotterdam. These parties have an interest in hands-on and actionable findings. Hence we will turn our IABR contribution into a concrete business case to develop Bospolder-Tussendijken. This week is 'the circular economy 2018 week’. The BNA, the Royal Institute of Dutch Architects, launched a campaign to enlarge the exposure of circular design. Architecture firms are taking the challenge to contribute to the ambition to have a circular built environment by 2050. To reach this goal we need new fundamental, circular considerations during the design process. By signing the ‘manifesto circular buildings’ P·A is now a front runner in the strive towards a circular design and building process! funding for project 'zon in de stad'! The Municipality of Rotterdam, the Province of South-Holland ánd the local initiative 'Mooi, Mooier Middelland' have guaranteed a contribution to the development and implementation of our 'Zon In De Stad' project. ZIDS is aiming to get the Middelland neighborhood familiar with the potential solar energy has and to stimulate and support its residents to produce energy themselves. The residents who already have solar panels become ambassadors and next to this we are realizing 'Solar Hubs' on strategic spots in the neighborhood. P·A was commissioned by Hanna, an ambitious young woman, to restore and redevelop an early twentieth century building in Rotterdam and turn it into a long-term investment property. The five-story building, which previously housed a health clinic, will become a private residence. Phase I, the realization of Hanna’s (current) private residence, is complete. P·A has been commissioned to transform a monumental building, currently in use as an office, into a Luzac school. Luzac was enthusiastic about the initial plans and opted for a ‘fast tracking process’ for rapid realization of the project. The engineering, bidding and execution of sub-components of the plan are being carried out simultaneously to enable the Luzac to move into the building in the first quarter of 2018. On Thursday, September 28th P·A presented the results of a large-scale research project that explores Rotterdam’s resilience when it comes to water. 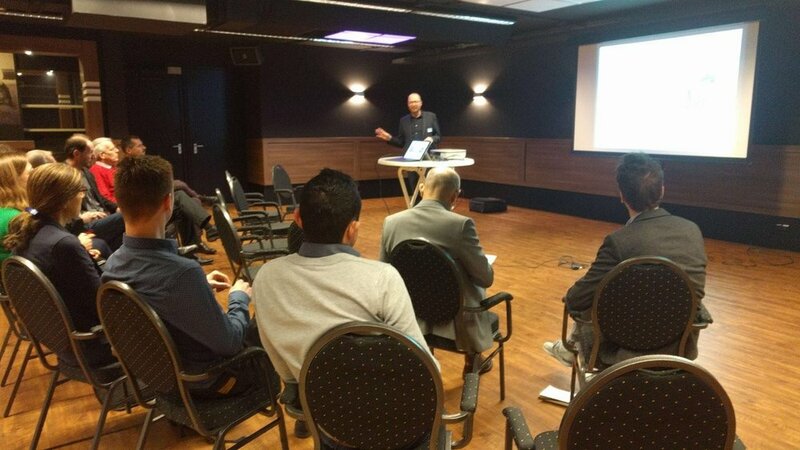 Various research partners, including the Municipality of Rotterdam, three local water boards, Havensteder housing corporation and water experts from i.a. the TU Delft were present for Sander van Schaik’s presentation of work carried out in collaboration with DJGA and Brink Architecture and Urban Design. The presentation addressed the mounting problems surrounding water storage in large cities, using the neighborhood of Rubroek as a case study. The results of the study offer practical solutions for smart water management in the private domain. Two weeks ago on the ‘Dag van de Stad’ in Amersfoort, we presented two of our collaborative research projects: Weerbaar Weert and Zon in de Stad. Weerbaar Weert was one of the case studies used in a discussion at the pavilion 'de veerkrachtiges stad' ('the resilient city') hosted by the Stimuleringsfonds Creatieve Industrie. Jip Pijs represented Weerbaar Weert alongside fellow projects from the 'Stedenbouw voor Extremen' trajectory all focusing on the relationship between cultural-historical values and climate adaptation. Zon in de Stad was represented in an exhibition hosted by Urban Futures Studio at the pavilion ‘de transformerende stad' (the transforming city’). Merel Paes hosted a tour to explain the project with help of three different metaphors developed by Urban Futures Studio to get a grip on transforming neighborhoods. "Practice what you preach" - according to Maarten Polkamp. Read this interview by Architectenweb on the development branch of P·A and our project OP DE HILL (Dutch only). The development division of P·A carries out real estate development projects on behalf of (private) investors as well as independently. Our focus is on the (re)development of high-quality, small-scale buildings that are carefully integrated into the urban fabric. To quote Maarten: "we develop buildings we would want to live in." Last week, we visited Heijkon Staalwerken to film the production of the steel for the tower at the Natuurpodium Brabantse Wal and Stayokay Bergen Op Zoom. Very impressive to see the stairs we designed coming to life. The Stayokay hostel & Natuurpodium opened its doors in 2015 and will now be completed with this tower! It is a sustainable and multifunctional building where nature is literally brought right in through the front door. This tower was part of our initial sketches so it is great to see it happen a few years later! We will be present not just once, but twice at 'Dag van de Stad' in Amersfoort on the 29th of October! We'll represent our collaborative projects Weerbaar Weert and Zon in de Stad. 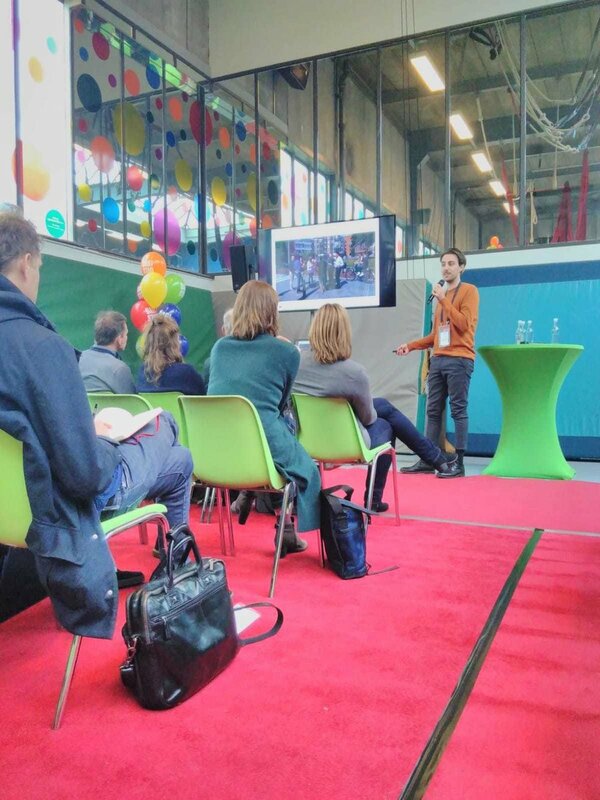 Dag van de Stad is a yearly conference for Dutch city makers: policy makers, designers, investors, and active citizens. Weerbaar Weert investigates how climate adaptation can act as a lever to improve the spatial quality of the historic city center based on cultural-historical values. We work in a team with NOHNIK architecture and landscapes and Lara Voerman in close collaboration with the Gemeente Weert. Zon in de Stad aims to spread the joy and fun of solar power. Together with Climate Focus and HilgersomDeen duurzaam, we work on spreading this message via solar shields, solar hubs, and solar pop-up stores. Go to www.zonindestad.nl to find out more. The past weeks, many neighbors placed their solar shields and now take part in Zon in de Stad. Great to see! Zon in de Stad aims to spread the use of solar power in Rotterdam. This summer, we will install solar shields at the doorposts of Rotterdam residents that own solar panels. The solar shields create awareness and enable neighbors to connect and get first-hand information on solar energy. Zon in de Stad is an initiative of Climate Focus, Personal Architecture and HilgersomDeen duurzaam, supported by CityLab010 and the Provincie Zuid-Holland. On Friday the 6th of July, the Rotterdam alderman for energy transition Arno Bonte placed the first solar badge! He was just one day in office and immediately found the time to support our initiative Zon in de Stad. Zon in de Stad aims to spread the use of solar power in Rotterdam. This summer, we will install solar shields at the doorposts of Rotterdam residents that own solar panels. The solar shields create awareness and enable neighbours to connect and get first-hand information on solar energy. Zon in de Stad is an initiative of Climate Focus, Personal Architecture and HilgersomDeen duurzaam, supported by the City of Rotterdam and the Province of South Holland. Maarten represented the board of the BNA Branchevereniging Nederlandse Architectenbureaus at the closing night of the Next Step Program in Kino. He handed the Next Step Award to architecture firm Civic, congratulations! The Next Step Program is a yearly talent program and award organized by the BNA and Synchroon to put young, emerging architects in the spotlight. On Friday and Saturday, Jip Pijs and Sander van Schaik joined the members of the international council of the Van Alen Institute on their two-day design charette exploring different sites in Rotterdam Zuid. The Van Alen Institute is a New York-based architectural design center that investigates the pressing urban challenges of tomorrow on a global scale. It was great to exchange ideas with this diverse group of reputable designers and other experts from New York, London, Stockholm and beyond. We thank the Van Alen and AIR Rotterdam for hosting this event and inviting us! P·A is also active on Facebook! We will share all the ins and outs of our office, update you with recent activities on building sites, bold projects and stories of users. Do you want to keep track of P·A, do not hesitate to like our Facebook page here. If you can't get enough of our projects, visit our LinkedIn and Instagram page for even more content! IMC Basis Rotterdam asked P∙A to give two lessons on architecture at a primary school in Nieuw Crooswijk, Rotterdam. Merel, Jip, and Juliette tutored a class full of enthusiastic kids. After a short introduction about architecture, the kids went to their first site visit as architects: the Koeweide square in their own neighborhood. In small groups, they worked on new buildings for the square. They designed a house, two apartment buildings, a swimming pool, and a community center. Armed with a potato knife, cardboard and foam they built models of their design and presented these models in a short pitch. The Environment and Planning Act aims to simplify regulation regarding spatial projects and better support social initiatives throughout the Netherlands. In response to this new legislation, all parties (local governments, companies, citizens and designers) will need to acquaint themselves with their new role in social initiatives. Maarten Polkamp has been invited by the Achitectuur Lokaal to lead a workshop intended for anyone involved or interested in the realization of a social initiative. After the workshop, Maarten will give a tour of the Stayokay hostel in Bergen op Zoom, a successful example of a future-oriented partnership between diverse local players. The event will take place on Thursday, December 14th. P·A welcomes Merel Paes to the team. The recent graduate of the Technical University of Delft joined P·A shortly after receiving her diploma and already she’s demonstrated her versatile skill set. Merel is involved in architectural projects, research projects and has assumed a position at the helm of an important internal project. Come by for coffee and get to know this young talent! On Tuesday, September 12th, Jip Pijs and Sander van Schaik organized a round table discussion with the Municipality of Weert, the Province of Limburg and the Cultural Heritage Agency of the Netherlands. 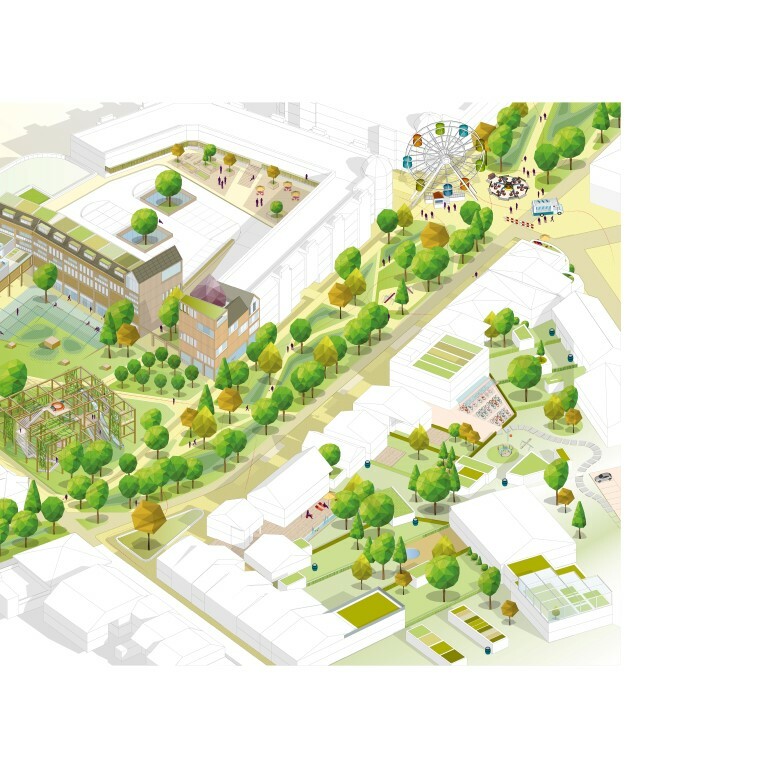 In the research design project ‘Weerbaar Weert’ (Resilient Weert), P·A and research partners NOHNIK and Lara Voerman are developing strategies to climate-proof Weert’s historic city center. The selected strategies leverage the city’s cultural heritage to prepare it for the next chapter in its long history. Local stakeholders received the initial research results with enthusiasm. In late October the team will submit their application to the Creative Industries Fund to continue this important project. 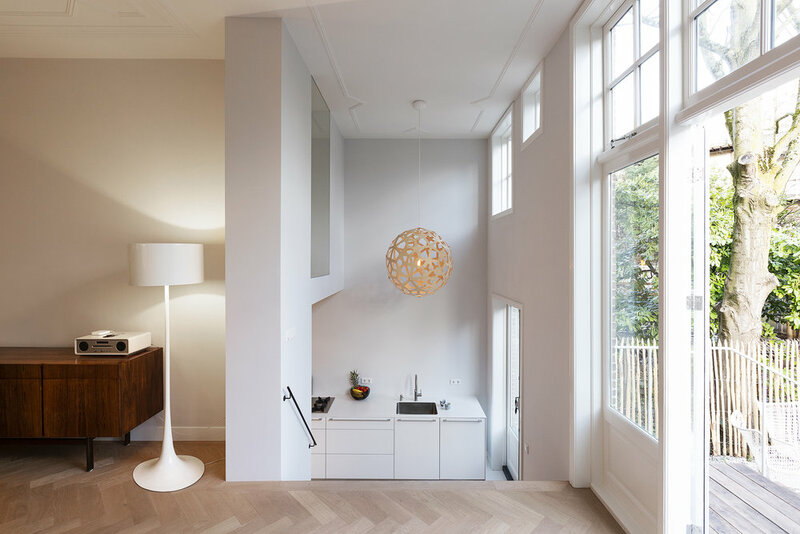 The ambitious remodel of Daan and Thao’s new home in Rotterdam is finished. The building, which was formerly used as an office and in very poor condition at the moment of purchase, has been completely stripped and rebuilt. The remodel restores the traditional characteristics and classic details of the early twentieth century building. Simultaneously, bold interventions have been added to the floor plan. The result is a bright and spacious house with spectacular split levels, mezzanines and sight lines. In 2014, P·A completed construction of the 30,000 square meter Akerpoort shopping center in Amsterdam Osdorp. In 2017, P·A was commissioned to develop a plan to transform the Akerpoort shopping center into a sustainable building. As part of this plan, the roof of the shopping center will house over 4,000 square meters of greenhouse, complete with building-integrated photovoltaics. Additionally, the shopping center will be fitted with a rainwater collection system. Are you interested in transforming your building into a green building? Don’t hesitate to reach out!